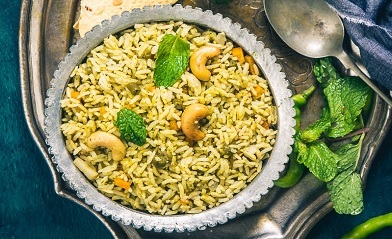 Pudina Pulao a light and easy dish with extra zing thanks to it’s strong pudina flavour. The pudina gives the pulao a refreshing taste, making it a favourite during summers. It’s easy to prepare and perfect for lunch or a light dinner. Popular in South India, it is a nutritious and satisfying meal which will leave you wanting more. Add all the ingredients to make Pudina Masala in a blender and blend to make a smooth paste. You can add a little water while making the masala. Once the masala is ground, keep it aside. Heat vegetable oil in a pan. 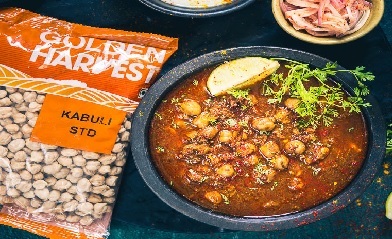 Once hot, add cumin seeds, cloves, black peppercorn and cashew nuts. Fry until cashew nuts turns slightly brown. Add onion and fry for 2-3 minutes until they turn translucent. Add tomato and cook for 2-3 minutes. Stir the masala regularly. Add the pudina masala and cook for a minute. Add potato, carrot, beans and peas. Fry on high heat for 2-3 minutes. Now add rice along with 2 cups of water and salt to taste and mix gently. Take care not to break the rice. Cover the pan tightly with a lid and cook the rice on low heat until all the water is absorbed and rice is cooked. Once cooked, serve Pudina Pulao hot with raita. The pudina gives the pulao a refreshing taste, making it a favourite during summers. Popular in South India, it is a nutritious and satisfying meal which will leave you wanting more. 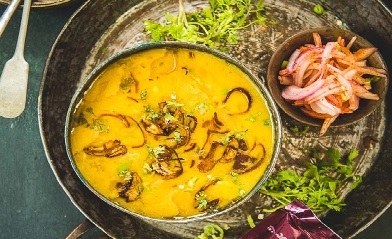 An extremely versatile dish, dal tadka can be enjoyed with pretty much anything, from jeera rice to Indian breads and even regular bread. Healthy and nutritious, itâ��s an excellent vegetarian source of protein. Comforting and delicious, this Amritsari Chole with Kulcha recipe is sure to awaken your appetite. Fill your home with the enticing aroma of this dish and watch how everyone comes together for a real family feast. Aadhaar Super Market is a company of Future Group with more than 99 stores spread in Punjab, Rajasthan, Gujarat and Andhra Pradesh. Aadhaar Super Market provides modern shopping experience to its customer in Rural and Semi Urban areas of the Indian States.Read More..